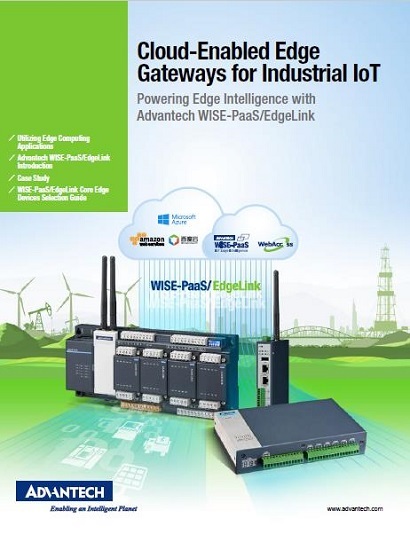 Advantech has built an edge computing IoT system from the ADAM-3600 intelligent remote terminal unit, which has WISE-PaaS/EdgeLink built in and is compatible with Azure Cloud Services. It accomplishes data collection, preprocessing, and transmission in one unit and integrates a cloud management platform that enables the installation of many continuous monitor systems with widespread measuring points and high-volume data management, thus allowing real-time the monitoring of discharged wastewater and ensuring compliance with public standards. To prevent environmental pollution from industrial and domestic sewage, environmental conservation agencies of many national governments have established laws aimed at preventing water pollution in order to enforce control over wastewater discharge. As an example, for many years in Taiwan, factories and industrial parks have been required to install automated wastewater monitoring equipment once their daily wastewater discharge volume reaches a threshold, as per the Environmental Protection Administration (EPA), which is the country’s authority governing water pollution management. However, monitoring data might be subject to manipulation and fraud, and regular audits have proven insufficient for eliminating such wrongdoings. Moreover, with rising public awareness on environmental conservation, the EPA has further requested industrial and domestic sewage effluent water quality data to be linked online and posted in real time on the EPA’s public platform in order to protect the environment and ensure corporate responsibility. In addition, some governments at the county and city level have established defensive monitoring systems in local rivers to monitor water quality and thereby prevent malicious wastewater discharge from entering the river systems. For such continuous monitoring systems, which require widely dispersed measuring points and the processing of large data volumes, system integrators need to build an automated wastewater monitor system that has a concise system structure and can be managed from a single platform. Advantech’s ADAM-3600 intelligent remote terminal unit (RTU) is an edge sensing system for data collection, preprocessing, and transmission forwarding. Its built-in WISE-PaaS/EdgeLink intelligent IoT core technology enables preprocessing (e.g., data summarization and conversion) at the device end, so that only key data are uploaded to the cloud platform, which saves communication costs while reducing the volume of data on the cloud platform. Therefore, system integrators may more efficiently develop an automated wastewater monitor system that complies with both factory system and government bid requirements. A Taiwanese system integrator who provides environment wastewater monitoring solutions was recently awarded an automated wastewater monitoring contract with a local government in northern Taiwan. The tender stated plans to monitor water quality in rivers and factory waste water effluents under jurisdiction, and this included volume, temperature, pH, conductivity, chemical oxygen demand, and suspended solids. According to the EPA’s requirements, data were to be transferred to the local environmental conservation authority’s monitoring center at specific intervals (chemical oxygen demand and suspended solids data were to be transferred once every hour, while the other monitor data were to be transferred every five minutes). The system also had to be linked to the EPA’s public platform in order to provide real-time data on water quality. 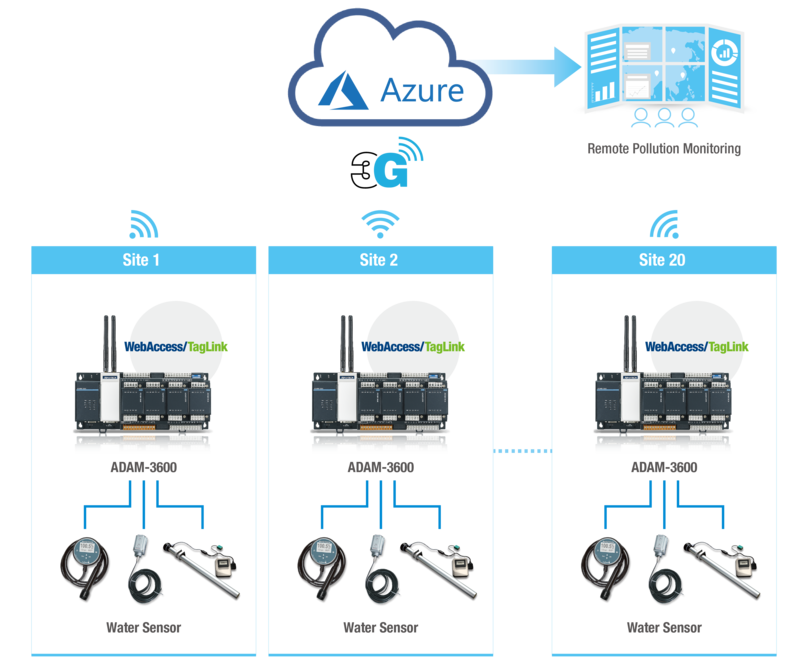 In contrast to the customary multi-layer structured automated monitor system, this system integrator introduced cloud IoT technology and, with the currently market-preferred device-to-cloud solution, set the system to transmit data via MQTT from nearly 20 types of water quality sensor at various test stations to a unified management Azure cloud platform. Data filtering and multi-point transmission features were implemented on the cloud platform to meet the information publication requirements of various governing authorities. The concise structure of the device-to-cloud configuration reduced not only the hardware cost of individual stations but also the hassle of testing for hardware compatibility. By utilizing a public cloud service, the system integrator was spared the expense of building a data storage environment as well as the trouble of system maintenance; moreover, this setup offers greater flexibility with regard to scalability for future system updates. Furthermore, as the measuring points are widely dispersed, the data are transmitted wirelessly via a 3G network, and so the base-layer equipment were selected to meet the requirements of outdoor applications while possessing edge computing and data preprocessing features to minimize data transmission over the long term and thereby cut future costs for system transmission. With only the ADAM-3600 intelligent RTU, which comes with WISE-PaaS/EdgeLink intelligent IoT technology built in, Advantech was able to meet the system requirements for continuous automated monitoring and cloud management. Water quality data are collected from various sensor brands at different measuring points and linked by the ADAM-3600, and then summarized, averaged, resized, or otherwise preprocessed through WISE-PaaS/EdgeLink. Finally, the processed key data are transmitted together via MQTT to the Azure cloud platform at the designated interval. Using a low power processor and supporting a wide temperature range (-40 to 70 °C), the ADAM-3600 is extremely suitable for outdoor installation and effortless remote monitoring and management via a cloud platform. In addition to the unit’s 20 analog and digital I/O channels, it has four scalable slots that allow users to install additional I/O modules. For example, the current project required both analog and digital input as well as digital output channels, and so the number and type of channels can be expanded with the optional ADAM-3617, ADAM-3651, and ADAM-3656 in order to handle data acquisition requirements under different environments. The flexibility of two Ethernet ports and two Wi-Fi/3G/GPRS/Zigbee-compatible wireless communication mini PCIe slots enable users to select the most suitable transmission method for device-to-cloud connections. 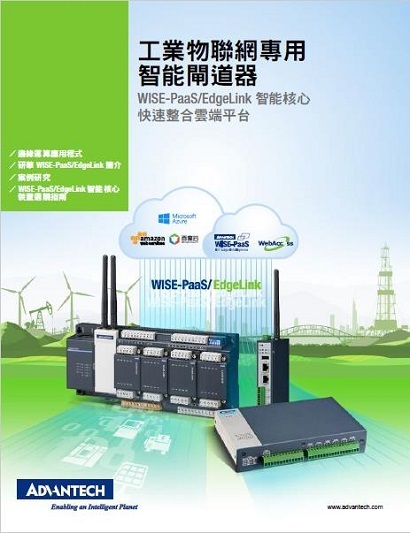 WISE-PaaS/EdgeLink plays a key role in device-to-cloud applications; specific to this project, its various practical features provide easier wireless communication for data forwarding. For instance, it supports multiple communications protocols (e.g., Modbus, DNP3, RESTful, MQTT, and IEC 61850-5-104) to connect with currently installed PLCs and the various sensors employed for physical signal collection. MQTT is also supported for seamlessly linking to third party public cloud platforms such as Microsoft Azure. In addition, before sending data to the cloud platform, it preprocesses data according to user settings, thus reducing the data transmission volumes. Previously, time-consuming software programming would have been required in order to accomplish this complex task, but now all it takes is simple setup process. For data transmission, the transfer resume feature can be employed to collect data in the ADAM-3600 SD card in the event of an unstable or interrupted wireless connection; should this occur, the data are then actively uploaded after the connection has been resumed, thus preventing data loss. Stopping water pollution is a vital job for environmental conservation, but treatment methods and strategy development both require the long-term collection of water quality data to establish a basis for analysis and development appropriate remedies. Device-to-cloud unified monitoring and on-site detection enables the direct transmission of data from work sites to back-end management platforms, thus preventing data manipulation and allowing environmental conservation agencies to learn about pollution discharge conditions in a comprehensive, real-time manner. 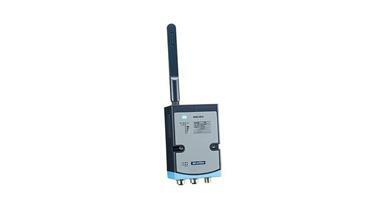 Advantech’s ADAM-3600 with WISE-PaaS/EdgeLink is a leading device in the field of environmental conservation and can satisfy the needs of environmental monitoring. System integrators may achieve device-to-cloud connectivity with simple settings on this compact RTU and shorten program development times. The RTU also handles many configurations of hardware products and thus simplifies maintenance work while the transfer resume feature ensures data accuracy and completeness. Multiple interface and modularization designs provide users with expansion options according to the intended application. Further demonstrating the reliability of the ADAM-3600, but water utility companies in China have also adopted the same system structure as the one used this project to build domestic wastewater discharge monitor systems in villages in suburban Beijing, thus confirming the suitability of this unity in the field of environmental conservation monitoring. By bringing data from field sites to the cloud, WISE-PaaS/EdgeLink software optimizes field equipment monitoring and management for optimized operations and maintenance.